John's Pump Service’s goal is to design sprinkler systems that make our farmer customers happy – and that also increase their yields and net income. The T-L Pump, Power & Engineering Division was established in the fall of 2003. 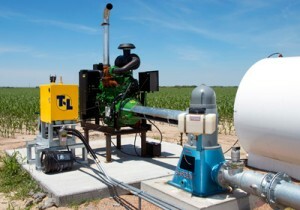 The T-L Pump, Power and Engineering Division’s purpose is to stock and have readily available for shipment to John's Pump Service, John Deere and Cummins engines, Cornell and Berkeley centrifugal pumps, self-cleaning suction screens, suction filters, and a complete line of fittings. But, perhaps even more important to farmers, is how the division complements the complete line of T-L center pivot irrigation equipment. For instance, an entire combo “package” of sprinkler, engine, and pump that are known to work both reliably and well together under varying conditions can be provided for new installations. T-L’s pump division works with John's Pump Service in designing the most effective and efficient pivot system installation that’s possible for a certain situation. When we trace it back we usually find that a redesign is needed. This may involve replacing the engine, pump, pipes, or perhaps a combination of changes. The result is an installation that takes advantage of the best that a T-L pivot irrigation system can provide.